Contact us to book your free CPD, supported by the British Council. We are offering free CPD for both primary and secondary schools in England, as part of Connecting Classrooms through Global Learning, supported by the British Council. 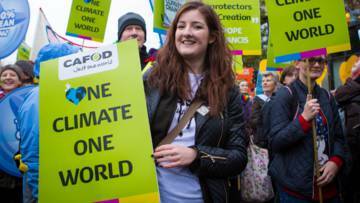 CAFOD’s Schools team offers continuous professional development resources for teachers and chaplains in Catholic primary and secondary schools to raise awareness of global justice issues. receive ongoing support to implement your learning. Our courses are available to book for your school or cluster (for example MATs). Please contact us for more information. Alternatively, book an individual place on one of our courses below. Connecting Classrooms through Global Learning supports teachers and school leaders to improve teaching, giving students the knowledge, skills and attitudes they need to make a positive contribution now and in the future. Through connections with other schools, professional development for teachers and engaging learning resources, Connecting Classrooms helps develop students equipped to live and work in a globalised world. Planning for Lent? Check out our new fundraising and prayer resources.